I catch the train into Leeds every morning, and instead of rushing straight to the office, I take a slight detour through some of Leeds’ alleys and yards, down onto The Calls and back up to work through the Markets. I see the same faces every morning, passing the same people in the same places, our independent routines apparently choreographed. I do this in the name of exercise (those 10,000 steps aren’t going to step themselves, are they? ), but really, I just like a bit of a wander in the morning, ten minutes or so to collect my thoughts and listen to a bit of music before whatever-the-hell is going to break loose at work actually breaks loose. On The Calls, just up from where the original La Bottega Milanese was, there’s a little coffee shop, a tiny place of thick plywood counters and hissing espresso machines. The door is normally open, and the smell of coffee drifts out into the street. It’s a massive draw, and I occasionally cave in and get an Americano or something. This is Kapow. It’s been there for about a year, in a fantastic spot, serving some really good coffee from the likes of North Star in Leeds and The Baytown Coffee Company from North Yorkshire. It’s always early in the morning when I stop there, and everything is nice and mellow, just cranking into life. Kapow is a good place to stumble into, grab a coffee, and sit for a minute watching Leeds wake up. I’ve been meaning to head down to Kapow for a while now. Must make more of an effort! 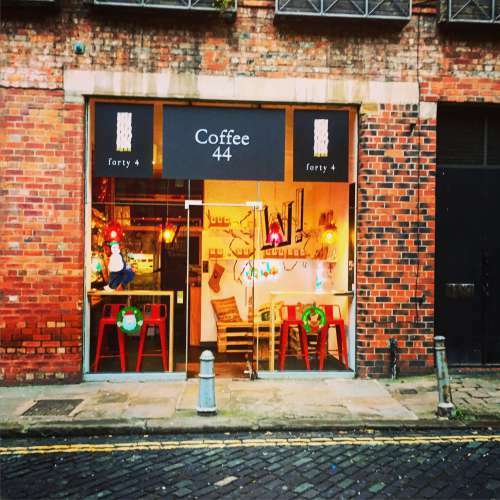 Best coffee house in Leeds! So friendly and chilled.